Recommended to: Readers who enjoy witty banter, mixed with mystery and farce. Ah, how I do adore when a book seems like it won't be something I'll enjoy and then it snatches me up and proves me wrong! 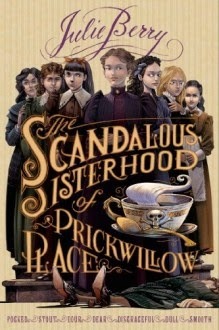 The Scandalous Sisterhood of Prickwillow Place did just that, and I couldn't be more pleased. Very much a Victorian farce, this is the story of seven young girls who suddenly find themselves in a rather unpleasant predicament. What follows contains murder, mystery, and plenty of witty banter. Delicious. It took me a while to warm up to the young ladies contained within this story. Each one has a very distinct personality which, as you might imagine, is very easy to remember when their name is preceded by an adjective to describe them. From "Disgraceful" Mary Jane, to "Smooth" Kitty, each one matches their description to a tee. So my big question was, at first, why did we need the addition? What was the point? I'll tell you though, it grew on me after a while. It added to the feeling of tongue in cheek humor, and after a while it didn't bother me anymore. On to the story, shall we? This reminded me a bit of the movie version of "Clue" in the way that it really didn't take itself seriously. I was given seven young women who, somehow, manage to cover up two deaths and pose rather well as though nothing is wrong. The twists thrown in were fabulous, the cast of supporting characters vibrant, and the clues perfection. I cracked up laughing more than once at the absurd entrances that possible suspects made. I loved that Julie Berry was able to write such a fun set of characters, each one perfectly fitting the space they filled. So, as you can see by my four star rating, I ended up enjoying this much more than I thought I would. The mixture of tongue in cheek humor, witty banter, and mystery wrapped me up and kept me reading. I'm so happy I gave this a shot! Much love to The Scandalous Sisterhood of Prickwillow Place. Note: This is shelved as Middle Grade Fiction but I highly doubt most readers that age would appreciate it. I'm shelving it as Young Adult Fiction instead.